Situated in the traditonal Mallorcan village of Santa Maria del Cami’, right in the centre of the island, this property offers far reaching views across wonderful countryside to the mountains. At only fifteen minute drive from Palma and a train station with a service that reaches Palma, the island’s capital, in 20 minutes. This gorgeous fully air conditioned property is perfect for guests looking for a quiet and private location in the heart of a vivaciously alive typical village. The entrance trough a vast hall gives access to a downstairs bedroom with ensuite and a conference room. On our left we reach the super modern, fully furnished kitchen with separate laundry/utility room with a service toilet. Further ahead we step into the indoor/outdoor living room, with its tall and completely foldable walls, this space is the most lived in, with direct views over the established gardens is the perfect space to let the world go by! On our right we access the enormous living room with very comfortable leather sofas, television and fire place, in this area we have a bright mezzanine used for meditation or yoga. Trough the stairs we access the master bedroom with the original stone walls, a quirky bathroom and fireplace. The room has a wide access to the gardens too. On the other side of the property we step into the second floor with an extra four bedrooms, a community space with snooker table and a gorgeous semi covered terrace with spectacular views over the mountain. 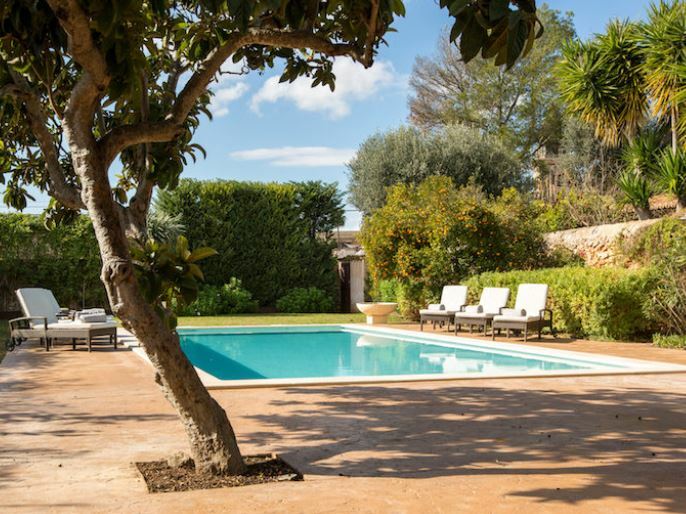 Coming back downstairs we access the amazing garden space, where a splendid swimming pool is lazily shining in the sun and a covered dining area, for 12 guests, make the perfect place for those most important “al fresco” dinner parties! Complete privacy and surrounded by a calm and relaxing feeling make this very spacious and full of charm property, the ideal place to spend very precious holidays!